The phrase ‘publish or perish’ has, for a long time, echoed down the halls of universities around the world. In the Australian and New Zealand context, academic staff are well aware of the need to produce quality-assured and peer- reviewed publications as part of the routine requirements of the job. This pressure extends beyond the avoidance of ‘the perish’ when one has already secured academic employment—it also exists during the postgraduate phase of study and on the job-search circuit once students are classified as ‘emerging researchers’ and have their higher-degree qualification in hand. After all, evidence of a publication record prior to employment demonstrates an active engagement with both an academic discipline and the publishing world. It is also peer-endorsed evidence of writing ability. Furthermore, according to Kamler (2008), “if students publish in their formative years, they are more likely to do so as established academics or informed professionals in their chosen fields of practice” (292). Following this line of thought, and on the occasion of the landmark seventh volume of this journal, our article asks, ‘What is the value of a postgraduate journal to emerging researchers?’. We look, in particular, at New Voices in Japanese Studies as one of the few specialist postgraduate journals in the Australasian region and as one which has a specific focus on Japanese Studies. Our perspectives come from our respective experiences: Elicia O’Reilly is the Series Editor of New Voices in Japanese Studies, and Shelley Brunt is both the guest editor for Volume 7 of New Voices in Japanese Studies and the ongoing editor for Perfect Beat: The Asia-Pacific Journal of Research into Contemporary Music and Popular Culture (Equinox). Our article is divided into three parts. It begins with an historical overview of the journal and recent changes which may serve to benefit emerging researchers. It then shifts to a discussion about the value of postgraduate publishing, which is supported by an analysis of qualitative data from a small sample of emerging authors. Lastly, it presents an overview of the authors and their articles written for Volume 7. Since the inaugural volume was released in 2006, this journal has published 54 articles by as many authors. A number of these authors (such as Elise Foxworth, Christine de Matos, Cristina Rocha and Chikako Nihei) have gone on to establish academic careers. Others have also produced monographs of their postgraduate theses to significant acclaim—a recent example being Masafumi Monden and his 2014 book, Japanese Fashion Cultures: Dress and Gender in Contemporary Japan, published by Bloomsbury Academic. As the importance of early-career publication continues to grow for academics, the journal’s vision is as relevant today as when the first issue was published. With the aim of keeping in step with the academic and media environments that researchers operate in today, Volume 7 introduces a number of changes to the journal. The original title—New Voices—succinctly communicated the goal of showcasing the ‘voices’ of emerging researchers. However, it lacked one important element: Japan. Read in a reference list or in online search results, there was no way of discerning from the journal title alone that the key unifying point for the authors was a shared research interest in Japan. With this in mind, the decision was made to update the journal’s title. From Volume 7 onward, the journal will be published as New Voices in Japanese Studies, making clear both its connection to Japan and its commitment to emerging researchers. The new title will more appropriately represent the journal in reference lists and databases, and promises to make its content more discoverable via online searches. In addition to the new title, we list here thirteen key characteristics that will distinguish New Voices in Japanese Studies going forward. Since its inception, the journal has invited local academics from Japanese Studies or related fields to act as Guest Editor for each volume. Guest editors have traditionally been responsible for providing academic input on submissions and in decision-making, copyediting and proofreading phases; advising authors; and contextualising each volume within contemporary Japanese Studies in an opening introduction. In the spirit of nurturing new talent, the journal selects early- to mid-career academics as guest editors. Guest editors bring expert knowledge of their field and the local academic environment, as well as substantial experience in publishing. Importantly, they also still freshly recall their own first forays into the publishing world, ensuring empathy for the emerging scholars who are submitting their work for publication, often for the first time. The journal could not exist without the hard work, dedication and generosity of the guest editors. The Editorial Advisory Board likewise differs for each volume. The board consists of at least two expert reviewers for each submission, who are selected based on the relevance of their expertise. In keeping with its remit of supporting Japanese Studies in Australia and New Zealand, the journal aims to appoint reviewers from Australia and New Zealand where possible. So far, the journal has been fortunate to welcome one alumnus back as Guest Editor, and other alumni back as Editorial Advisory Board members. It is hoped that, over the coming volumes, the journal will see more contributors return in an editorial capacity to support following generations of up-and-coming scholars. All journal submissions are double-blind peer-reviewed to meet the Australian Department of Education and Training (DET)’s Higher Education Research Data Collection requirements for refereed journal status (DET 2015). In addition, all submissions are reviewed in detail by the academic Guest Editor for each volume and are subject to copyediting and proofing prior to publication. Increased resources have been devoted to the copyediting and proofing phases over the two most recent volumes. Even though “Japanese Studies” now sits firmly within the title, it is important to note that the journal remains interdisciplinary. New Voices in Japanese Studies publishes papers from fields as diverse as sociology, international relations, comparative literature, linguistics, history, photography, fashion and pedagogy, to name a few (see Tables 1 and 2). One of the most exciting aspects of this journal has always been the breadth of its scope, reflecting the multifaceted nature of the local academic community’s interest in Japan. New Voices in Japanese Studies is keen to nurture this breadth by continuing to publish work from a wide range of fields. This breadth of content, combined with a narrow window of eligibility for contributors and relatively low frequency of publication, is the reason why the journal’s volumes—with the exception of the inaugural volume—are unthemed. While theming can be helpful for readers, it limits opportunities for submission. Keeping the journal thematically open ensures a more effective and accessible platform for emerging scholars, and therefore best aligns with the journal’s mission. The previous six volumes of this journal were published both in print and online, and a look back at the layouts shows that the focus at the time was on the print version of the publication. This resulted in an online presence that adhered more closely to conventions for print. Volume 7 heralds a shift to online-only publication, and to layouts designed specifically for online use. This change reflects the increasingly online nature of academic work and, importantly, library collections: a number of academic libraries had begun to decline hard copies of the journal, which greatly influenced the decision to discontinue print editions. A significant advantage of the shift away from print is that it allows the time and resources formerly devoted to producing and distributing print copies to be directed to areas that are more likely to increase the value of the journal for contributors and researchers. These include building a website that offers improved access to content; creating a distinctive new visual identity; and indexing on third-party databases. (Source: The Japan Foundation, Sydney, 2015). Note: Interdisciplinary work is listed under the most salient field. Categories are indicative only. (Source: The Japan Foundation, Sydney, 2015). It is worth noting here that the journal has always been, and continues to be, free to access. New Voices in Japanese Studies is fully funded by The Japan Foundation, Sydney, and is sustained by the commitment of established scholars in the Australia-New Zealand academic community who generously offer their time and expertise as referees and guest editors. In doing so, they add support to the journal’s wider aim of nurturing the next generation of local researchers with a professional interest in Japan. Thanks to this valuable support, there is no cost to authors for publishing their research in the journal. This differentiates New Voices in Japanese Studies from the increasing number of online academic publications that are moving from a ‘user pays’ subscription-based access system to an ‘author pays’ open access system (see Lawrence 2005). In other words, New Voices in Japanese Studies offers a rare two-way open-access system. Going forward, in the spirit of furthering open access and ensuring the best possible exposure for contributors’ work, New Voices in Japanese Studies plans to adopt a Creative Commons licensing model from Volume 8. Arguably the most obvious change to the journal is the new logo and look of the publication. New Voices in Japanese Studies needed a logo that incorporated the new name. At the same time, many other aspects of the journal were also set to change, so it seemed fitting to visually communicate this by transforming the journal’s public face as well. The inspiration for the new logo is a ‘pen-meets-hanging-scroll’ concept. This fuses the archetypal pen-and-paper image of university study with a subtle Japanese influence, seen in the way that the pencil folds, obi-like, into the signature “NV” graphic (see Figures 1–3). The overlay of the logo onto komon-style patterns adds a more direct visual association with Japan. The content of the work published within New Voices in Japanese Studies deepens and sometimes challenges what we know (or think we know) about Japan. Opting for subtlety with graphics was a deliberate effort to reflect this aspect of the content at a visual level. Figures 1–3 (L–R): Examples of the pen-and-paper and Japanese scroll imagery which form the basis of the journal’s new logo. Fig. 1 courtesy Jonathan Kim/Flickr (CC BY-NC 2.0); Fig. 2 courtesy Chris 73/Wikimedia Commons (CC BY-SA 3.0). The new article layouts boldly incorporate the new logo to improve the visibility of the journal and help to raise its profile. Other new features include article cover pages, wide margins for note-taking, and bibliographic information on each page, designed to improve both readability and usability. Another visible change is the incorporation of Japanese script into the papers. In Volumes 1 to 5, the use of Japanese script was limited to examples cited in linguistics and other language-related papers. This changed in Volume 6, with Japanese-language titles appearing in Japanese script as well as in romanised form in references lists, and original Japanese transcriptions of primary source material published alongside English translations (see Catherine Hallett’s “Music in Kamigata Rakugo Performance”, for example). The primary purpose of this change was to help Japanese-literate readers to more easily locate source material of interest, or appreciate nuances in source material that are difficult to convey in translation. A second purpose was to ensure the symbolic visibility of Japanese perspectives and Japanese voices within English-language work on Japan. Based on reader feedback, Japanese script for author names has also been incorporated into reference lists in Volume 7, as well as Japanese script for notable subjects such as people, places and organisations. Again, these changes have been made with the aim of aiding follow-up consultation of Japanese source material by readers. It is hoped that this will not only facilitate but encourage consultation of source materials beyond those available in English by contributors and readers alike. A research paper exploring a language and culture apart from that in which it is written will often incorporate vocabulary from the target language/culture, in addition to specialist vocabulary from the researcher’s discipline. With this in mind, the journal has begun working with authors to ensure that extensive glossaries are provided at the end of such papers. The addition of glossaries improves accessibility for readers across disciplines with varying depths of knowledge about Japan and the Japanese language. There is also potential for these glossaries to take on a life of their own and be used as general reference resources to support further reading, beyond the papers that they were originally designed to accompany. Examples can be found in Catherine Hallett’s “Music in Kamigata Rakugo Performance” (Volume 6) and Jenny Hall’s “Re-Fashioning Kimono: How to Make Contemporary Clothes for Modern Japan” (Volume 7). In recent years, calls for papers have been open to Honours and Masters graduates only. However, consultation with both established and emerging researchers has indicated a need for more publishing opportunities at PhD level. For this reason, Volume 7 was opened to PhD candidates for the first time since Volume 1 (see Table 3), essentially bringing the journal back to its roots. Volume 7 includes two papers at this level: Ross Tunney’s “Imaging the Rural: Modernity and Agrarianism in Hiroshi Hamaya’s Snow Land Photographs”, and Jenny Hall’s “Re-Fashioning Kimono: How to Make Contemporary Clothes for Modern Japan”. From Volume 8, the scope will be broadened further to include recent PhD graduates. Work by outstanding Honours and Masters students continues to be welcomed, and prospective contributors are encouraged to benchmark their work by referring to recently published papers by authors with similar levels of experience. Volume 7 includes two examples of work by Masters students: Toshiyuki Nakamura’s “Motivations for Learning Japanese and Additional Languages: A Study of L2 Motivation across Multiple Languages”, and Mina Qiao’s “Sexuality and Space: Tokyo and Karuizawa in Mariko Koike’s Koi”. The most recent example of an Honours- level paper, also in Volume 7, is Miles Neale’s “A Comparison of English and Japanese Proverbs Using Natural Semantic Metalanguage”. Table 3: Changes in Eligibility Criteria, Volumes 1-8. 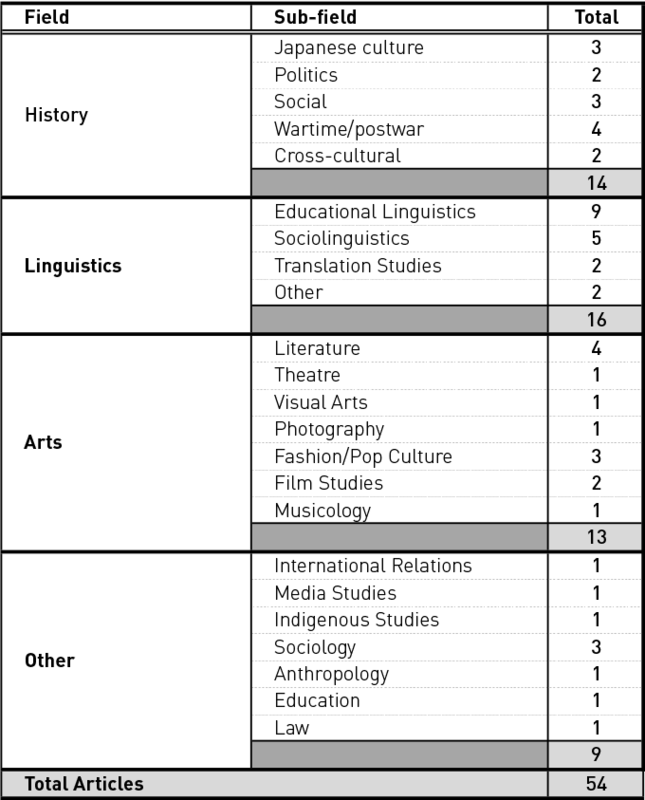 This table shows the eligibility criteria for contributors in terms of academic level and region for each volume of the journal to date (Source: The Japan Foundation, Sydney, 2015). Table footnotes1 2 3 4. The scope of contributor eligibility has also broadened in terms of region, with the aim of increasing the profile of the journal and supporting networking between local researchers and their peers in the Asia-Pacific region. It is also a response to the mobility of contemporary scholars. When the journal began in 2006, the call for papers was only open to researchers actively studying in Australia. Volume 7, by contrast, was open to researchers who studied in Australia and New Zealand or were citizens of those countries. It was also open to postgraduates from the wider Asia-Pacific region who had actively sought to build networks in Australia by participating in The Japan Foundation, Sydney-funded Japanese Studies Graduate Workshop (JSGW) at The Australian National University (see footnote 2). Eligibility will be broadened further for Volume 8, which will also be open to permanent residents of Australia and New Zealand, and international participants of the Japanese Studies Association of Australia (JSAA)’s 2015 Graduate Workshop, also supported by The Japan Foundation, Sydney. The primary focus on Australia and New Zealand is in line with the operational remit of The Japan Foundation, Sydney. At the same time as the scope has broadened, the standard required for publication has also risen in recent volumes. From the beginning, journal policy has held that all submissions are double-blind peer-reviewed by experts in related fields. Publication has always been contingent upon the authors’ ability and willingness to respond to expert feedback, as well as the originality of their work and its contribution to knowledge. However, in early editions, the focus was arguably on providing a platform for as many new voices as possible. From Volumes 2 to 5, for example, the most outstanding work was collated into a print volume and also released online, while a second selection of articles was published online only. Volume 6 marks a transitional phase in terms of editorial approach, with a more rigorous editing process resulting in all papers being released both in print and online. From Volume 7, the editorial direction will prioritise the most outstanding new voices, and strive to ensure greater consistency of quality across individual volumes, and across the journal as a whole. This shift aims to bolster the credibility of the journal, and ensure that publication in New Voices in Japanese Studies becomes an even greater asset for authors—particularly those who seek to embark upon an academic career. The points listed here are only the beginning. With the continued assistance of the local academic community in writing, reading, reviewing for and citing from this journal, New Voices in Japanese Studies looks forward to evolving even further, to better support the future of Japanese Studies in Australia, New Zealand and beyond. 5) What has been the most challenging part of publishing with New Voices in Japanese Studies? The authors completed the survey at the end of the copyediting process, long after their articles were accepted, and were aware that their comments would be presented here as part of this discussion. We have chosen to de-identify their responses. As such, comments are attributed to ‘Author 1’, ‘Author 2’, ‘Author 3’, ‘Author 4’ and ‘Author 5’, with numbering based on the order in which we received their responses. The summarised results from even this small sample of postgraduate authors offer insights into how the publishing process can help new scholars develop skills that are valuable for their research degrees, as well as their future careers. The most challenging part of publishing with New Voices [in Japanese Studies] was making the vast array of changes to my work suggested by my reviewer[s]. If I had structured my submission more logically, however, I would not have had this problem, so it is entirely my fault. The editing process took a longer time than I expected. For me, I think [the most challenging part] is the editing process. Because the article is based on my … thesis … I found there were so many things that I wanted/needed to change. The PhD authors also felt the pressure of completing the required corrections in order to meet publication deadlines. However, it may be assumed that prior experience with publishing had given them a broader perspective of the publishing process in general, which had in turn created expectations about specific aspects of this journal. Adhering to New Voices in Japanese Studies’ in-house style guide, for example, was sometimes difficult, and the final deadlines also created pressure. I found that the NV Style Guide was not always clear. In particular, citations of unpublished interviews and of websites. NV says to refer to the Chicago Manual of Style but they give two ways to cite the former, and both of these differed from what I was advised to do by the reviewers in my first round of feedback. The deadlines for the last round of editing were a bit too tight (although I appreciated the forewarning of this), especially considering the amount of editorial comments and suggestions that had to be addressed. In addition to providing insight into the experience of the authors, feedback such as this is incredibly valuable for the journal at an editorial level, as a basis for refining editorial resources and production timelines. I have read the articles which are written by some previous and current PhD students in my university and was impressed by their works. And I thought, as a postgraduate student who [is a] major in Japanese language education, New Voices [in Japanese Studies] is the most suitable place to submit my paper. I felt it to be a good way to have my work read by those in the Australian Japanese Studies field (and hopefully internationally). I was keen to submit to a journal that specialised in Japanese studies. Sometimes external motivation is needed for students to consider publishing their writing. Importantly, three of the five authors indicated that their supervisor “encouraged” them to submit their article for consideration, thereby providing an impetus to begin their publishing career. I was encouraged by my supervisor to submit my work to New Voices. I saw the journal as an excellent opportunity to extent [sic] my studies and release my work into the public domain. My supervisor encouraged me to submit. I was also looking for opportunities to get published. Encouragement of this kind is welcomed by journals such as New Voices in Japanese Studies, and is perhaps not surprising, given that the Australian higher education climate is one where there is pressure for postgraduates to produce peer-reviewed publications during their candidature. Edwards, Bexley and Richardson’s 2011 report from the 2010 National Research Student Survey provides recent data to support this: 80.8% of PhD and Masters by research students surveyed (across 38 of the 39 universities in Australia; 25.5% response rate) indicated that their supervisors “encouraged” them to “publish in peer reviewed journals” (2011, 56). More recently, this was anecdotally reinforced at the Graduate Workshop panel held at the Japanese Studies Association of Australia 2015 biennial conference, where established Australian academics stressed the importance of publishing early as part of their advice to postgraduate scholars. The most valuable part of publishing with New Voices [in Japanese Studies] has been having my work scrupulously critiqued by [blind peer reviewers]. Initially, I was disheartened by the amount of problems the reviewer[s] found with my work, but after editing it, I realized just how much it had improved, and just how valuable the reviewers’ input had been. The peer review process was very helpful in making sure my argument and supporting points were as clear as possible. It is always helpful to get feedback from other academics, and to get a perspective on a particular part of my research. I have completed most of my thesis and am now honing and editing, so such detailed criticism is very useful at this stage of my PhD. Another benefit to publishing from the thesis during candidature is that the author can cite their own article in the dissertation, thus drawing an examiner’s attention to evidence of their command of the topic. 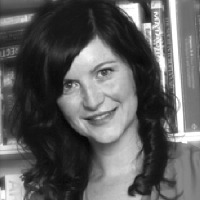 Mullins and Kiley’s research on examiner’s perceptions of Australian PhD dissertations confirms that “when [a student’s] thesis is presented for examination the examiner will be favourably influenced by the fact that the work has already been subject to peer review and found acceptable” (2002, 381). This gives the examiner confidence that the research has already been externally vetted. It could even be taken as an indication of a student’s commitment to their work, and possibly to a future career as a researcher. Cuthbert, Spark and Burke observe that it takes more than a passed dissertation to qualify a candidate for a career in academia in the Australian fields of Humanities, Arts and Social Sciences, because “the publication of refereed papers during candidature is fast becoming an expected part of graduating as a competitive researcher” (2009, 139). Several of our authors in this volume saw their publication as the first step in developing a track record in research—a clear benefit to them in their quest for an academic career. This will be my first publication. I will have a ‘publication list’ along with my CV the next time I apply for a fellowship or a program. This is the first time, for me, to publish my own work. So I am grateful to New Voices for giving [me] the opportunity. It is [the] starting point of my career as a researcher. Of course, not all authors pursue academia; some may prefer to turn to the professional fields. Regardless of one’s career choices, however, turning an original idea into a fully formed journal article takes commitment, drive and passion. It is not an easy task to refocus ideas which were originally intended for an Honours, Masters or PhD dissertation and fine-tune them for a journal article format that assumes a much wider readership. Our authors have taken this courageous step and we are delighted to present their work in this issue. Ross Tunney, a PhD candidate at the University of Tasmania, takes the reader into the world of Japanese documentary photography through his analysis of the 1940s-50s Snow Land series, produced by the celebrated photographer Hiroshi Hamaya. In doing so, he sheds light on how the idealised and utopic Niigata Prefecture village life depicted in the photos contrasts with the reality of wartime and post-war recovery. What follows is a sophisticated argument about the use of ideological discourses of the pastoral to reinforce Japanese identity, where the author ultimately views the Snow Land series as a critique of modernity. Mina Qiao, a PhD candidate at the University of Auckland at the time of submission, chose New Voices in Japanese Studies as a forum to publish material from her Honours dissertation. “Sexuality and Space: Tokyo and Karuizawa in Mariko Koike’s Koi” analyses a contemporary novel set against the backdrop of the 1970s student movements in Japan. Qiao’s compelling reading of the novel shows how the author uses two key settings, Tokyo and Karuizawa, as mirrors and even catalysts for characters’ lifestyles and life choices throughout the narrative. Koi  is not yet available in English translation, making her work a fresh and valuable contribution to English- language scholarship on Japanese literature. Toshiyuki Nakamura’s “Motivations for Learning Japanese and Additional Languages: A Study of L2 Motivation across Multiple Languages” is derived from his Masters thesis, undertaken at Monash University. The paper examines factors driving language learning, using motivational psychology and the concept of possible selves as a framework to compare learners’ attitudes towards different languages. His research seeks to understand what influences learners to continue language study, with a focus on competition between languages in multilingual learners. Nakamura’s findings may be useful for Japanese language teachers interested in promoting student retention. Jenny Hall, an Honours graduate in anthropology and PhD student at Monash University, examines the value of Japanese clothing in communicating identity. Based on ethnographic fieldwork in the Kyoto heritage textiles industries and including interviews with key stakeholders, the article refutes the perception that traditional Japanese apparel production is in decline. Instead, a case is made for technological innovations such as digital looms to be seen as extensions of traditional techniques. Hall then draws attention to contemporary fashion in Japan and how consumers are embracing core elements of traditional apparel, from samurai armour to Imperial Court cuffed trousers, as a revitalised expression of Japanese culture. Miles Neale’s “A Comparison of English and Japanese Proverbs Using Natural Semantic Metalanguage” is based on his Honours thesis, completed at the University of Queensland. This paper takes an in-depth look at two pairs of proverbs that are positioned as equivalent in Japanese-English proverb dictionaries, and highlights the differences between the cultural logics that underpin them. In doing so, Neale problematises the practice of proverb pairing in language-learning resources and language education. He suggests that more attention should be paid to the culturally significant nuances that differentiate apparently similar proverbs, rather than simply focussing on the links between them, and calls for further examination of proverb pairs in this vein. We would like to take this opportunity to thank the authors for choosing New Voices in Japanese Studies, and for their cooperation throughout the publishing process. We hope that these publications pave the way for many more to come, and that the experience of publishing with New Voices in Japanese Studies proves to be an asset for their future careers. New Voices in Japanese Studies can only maintain its high standards with the assistance of an experienced and dedicated Editorial Advisory Board. We wish to extend special thanks to the editorial advisors for this volume (in alphabetical order): Associate Professor Simon Avenell (Australian National University), Associate Professor David Bell (University of Otago), Dr Mio Bryce (Macquarie University), Professor John Clark (The University of Sydney), Professor William Coaldrake MVO (The University of Tokyo), Dr Barbara Hartley (University of Tasmania), Dr Carol Hayes (Australian National University), Dr Peter Hendriks (Australian National University), Dr Gary Hickey (The University of Queensland), Dr Shunichi Ishihara, (Australian National University), Dr Kyoko Kawasaki (The University of Western Australia), Professor Vera Mackie (University of Wollongong), Professor Mark McLelland (University of Wollongong), Dr Masafumi Monden (University of Technology, Sydney), Professor Tessa Morris-Suzuki (Australian National University), Professor Debra Occhi (Miyazaki International College), Professor Roy Starrs (University of Otago), Dr Rebecca Suter (The University of Sydney), Dr Rowena Ward (University of Wollongong) and Professor Anna Wierzbicka (Australian National University). We would also like to thank our authors’ supervisors for recommending New Voices in Japanese Studies and supporting their students’ submissions, as well as for offering valuable advice to their students during the writing and editing phases. We are grateful to Dr Barbara Hartley (University of Tasmania), Dr Lawrence Marceau (University of Auckland), Dr Robyn Spence-Brown (Monash University), Professor Carolyn Stevens (Monash University) and Dr Masataka Yamaguchi (University of Queensland). Particular thanks are due to Dr Barbara Hartley and Yukiko Burns for their invaluable assistance in seeking permission to reproduce the arresting photographs by Hiroshi Hamaya that accompany Ross Tunney’s paper, and also to Jenny Hall for obtaining permission to reproduce photographs of Sou-Sou’s products in her paper, alongside her own stunning images. Finally, this volume of New Voices in Japanese Studies (as well as volumes to come) owes much to the following individuals: Jon Zhu, for the journal’s fresh new logo and layout template; Kevin Vo, for the new website, design expertise, and for his flexible troubleshooting through our first round of article layouts; Ayusa Koshi, manager of the Japanese Studies department at The Japan Foundation, Sydney, for her unflagging support of the journal and the renewal project; and Nao Endo, the director of The Japan Foundation, Sydney, for his commitment to supporting tertiary-level Japanese Studies in Australia. In sum, it has been a challenging but highly rewarding experience working with everyone involved in the creation of Volume 7, which is a significant milestone for New Voices in Japanese Studies. This begins a new phase for the journal, and we hope that researchers locally and beyond will continue to read, cite and support the outstanding new voices selected to appear in its pages, just as we look forward to continued contributions from exciting new scholars in volumes to come. Cuthbert, D. and C. Spark. 2008. “Getting a GRiP: Examining the Outcomes of a Pilot Program to Support Graduate Research Students in Writing for Publication.” Studies in Higher Education 33 (1): 77–88. Cuthbert, D., C. Spark and E. Burke. 2009. “Disciplining Writing: The Case for Multi‐disciplinary Writing Groups to Support Writing for Publication by Higher Degree Research Candidates in the Humanities, Arts and Social Sciences.” Higher Education Research and Development 28 (2): 137–149. DET (Department of Education and Training). 2015. 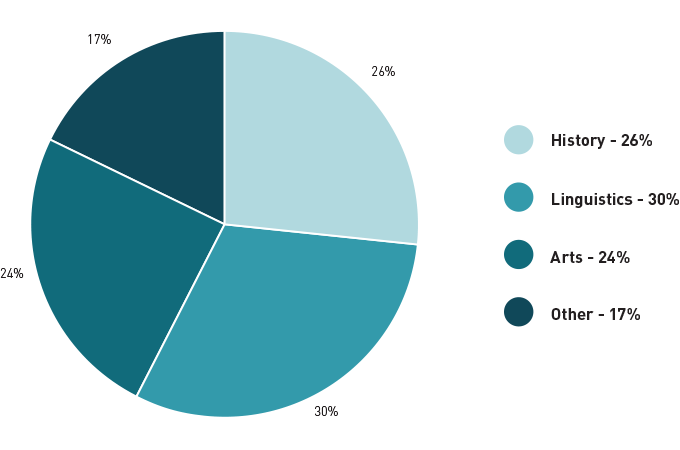 Higher Education Research Data Collection: Specifications for the Collection of 2014 Data. Accessed May 15, 2015. https://docs.education.gov.au/system/files/doc/other/final2015herdcspecifications_1.pdf. Edwards, D., E. Bexley and S. Richardson. 2011. Regenerating the Academic Workforce: The Careers, Intentions and Motivations of Higher Degree Research Students in Australia: Findings of the National Research Student Survey (NRSS). Accessed 6 June, 2015. http://researcacer.edu.au/higher_education/23. Kamler, B. 2008. “Rethinking Doctoral Publication Practices: Writing From and Beyond the Thesis.” Studies in Higher Education 33 (3): 283–94. Lawrence, D. J. 2005. “Editorial: Open Access Publication is Growing in Importance.” Journal of the Canadian Chiropractic Association 49 (3): 141–45. Lee, A. and B. Kamler. 2008. “Bringing Pedagogy to Doctoral Publishing.” Teaching in Higher Education 13 (5): 511–23. Mullins, G and M. Kiley. 2002. “‘It’s a PhD, Not a Nobel Prize’: How Experienced Examiners Assess Research Theses.” Studies in Higher Education 27 (4): 369–86. “Notes on Contributors.” 2006. New Voices 1: 100–01. The Japan Foundation, Sydney. 2015. New Voices in Japanese Studies. Accessed June 6, 2015. http://newvoices.org.au. Ueno, Y. 2006. “Foreword.” New Voices 1: iii.